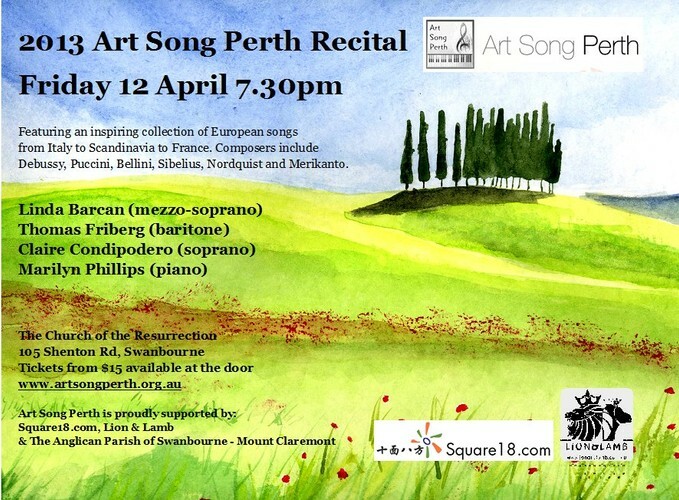 Art Song Perth opens its 2013 recital series on Friday 12 April. Linda Barcan (mezzo-soprano), Thomas Friberg (baritone), and Claire Condipodero (soprano), will present a varied programme of songs. The inaugural recital will include many favourites of the Art Song repertoire, as well as first Perth performances of some exquisite lesser-known songs by Puccini, Merikanto and Sibelius. Be amused and intrigued by The English Mouse, The Rules of Grammar, and more, in Manuel Rosenthal’s Songs for Monsieur Bleuet. The three singers will present their songs informally, with interesting background information on their songs, and they will be accompanied by Marilyn Phillips. Tickets are available at the door and light supper is included. Full details of the programme, as well as profiles of the artists are available.